When the Kibbitzer-In-Chief visited the local Persian market, she didn't feel that bringing back a single Weird Soda would be sufficient. In fact, she found three. Unfortunately, they are all yogurt-based. The first was Abali, reviewed previously. It was hideous; cheesy, with an overtone of spoiled milk. However, The K-i-C found two others at the same time. These other two are siblings, two flavors from the same brand. One might think that a flavored yogurt soda might be nice--after all, people eat frozen yogurt enthusiastically, right? And you can get any number of nice fruit yogurts in the grocery store. Maybe this will be like that--carbonated peach yogurt, or wild berry, or something like that. That might be OK. I don't know if such things exist, but that's not what the K-i-C brought back to the Lab. Instead, she brought back two flavors of Arvand Sparkling Yogurt Beverage. The first flavor is "Mint". I don't recall ever seeing mint yogurt before. It's not a flavor I would normally think would go well with yogurt, although I suppose it might be interesting. The second flavor is simply called "Tart". I can think of several interpretations for this. It could be "Tart" as in "raspberry tart, bought at some nice British market, a flavorful confection of pastry and fresh berries". That could be good. I suppose it might even mean "Tart" as in "a person, usually female, characterized by a sarcastic attitude, and possibly of suspect moral character". I'm choosing not to speculate on how that might manifest as a soda flavor. However, I'm guessing that it means "Tart" as in "tangy, sour, or astringent". Oh, goody. Another interesting thing to note about these sodas: while they were bought in a Persian market, they were made in Canada. Specifically, Vancouver. This is the first trilingual soda label I've ever seen; the ingredients are listed in both English and French, and the main label is in English on one side and something which I presume to be Arabic (although I'm sure I wouldn't know the difference between that and Farsi, or maybe something else) on the other. So here we have Arvand, a sparkling yogurt-based soda, made in Canada, marketed in California in a Persian market, being tasted in Mint and "Tart" flavor varieties. It's another good day at the Weird Soda Review Labs. Color: both are identical: milky white, separated (before shaking) into a vaguely translucent upper layer and an opaque lower layer. The lower layer turns out to be composed of yogurt solids, which is evident upon shaking; they separate into clumps and streamers distributed throughout the volume of the bottle. This does not fill me with transcendent joy. Doesn't smell quite as bad as the Abali. Sour and minty. K-i-C: "It smells like a tablet you're supposed to chew to cure indigestion." Punctilius: "Smells chalky. Milk of magnesia." Punctilius: "I'd rather drink the cabbage." Very tart. Not as much of the spoiled-milk taste as the Abali, and the mint is present, but it's overwhelmed by the yogurt. Salty and sour, with a touch of mint, overwhelmingly strong. This is not remotely refreshing. Leaves a chalky texture on your tongue. K-i-C: (hands it back) "I can't even taste that. Sorry." Punctilius: "Some things, you develop a taste for, like Scotch. It would be a long time before you developed a taste for this. It's making my stomach churn." The aftertaste has a bit more of the mint and less of the yogurt; it's not as unpleasant. Not that it's good, mind you--just less revolting. Interesting. There's an undertone which almost tastes like brown rice--kind of nutty (as in nut-like, not insane). I'm not sure what that's doing there. It's a measure of how unpleasant this is tht a hint of bran in the flavor is a welcome distraction from the rest of it. When the taste of rice in a soda is as much of a relief as the sight of water in a parched and barren wasteland, you know your soda is not just Weird, but Icky. Given how extremely strong the salt/sour of the yogurt taste is in this, I am scared of the "Tart" flavor. But scared doesn't matter. I have NO FEAR! Oh my God. It's much like the Abali; spoiled, fermented milk. Punctilius: "That smells like something left in the refrigerator about two weeks past date." The K-i-C can't even speak; she just hands it back. Taste: I hesitate, caught between dread and duty. Aw, heck. Let's go with duty. Actually, it tastes better than it smells. K-i-C: "You'll have to live alone with that knowledge." It doesn't taste good, but it does taste rather a lot like cheddar cheese. Compared to the smell, that's actually almost good. I find myself able to sip it again. Let's try a bigger sip. Er. Okay, we won't try that again. But in small sips, it's drinkable. Not enjoyable, exactly, but drinkable. The aftertaste is less pleasant; I'm not sure what it is, vaguely gassy. If I wanted a cheddar cheese soda, and could avoid smelling it, I'd go with this. My duty--my calling--requires something of me which I don't want to do. To truly provide a reasonable comparison, I must re-sample the Abali. In my memory, it's worse than these--a worse smell than the Tart, and a worse taste than the Mint. But in the interests of science, and for the integrity of Weird Soda Review, I feel compelled to open a fresh Abali and sample it. We who are about to quaff salute you. Nyghughuglrugh...I was right. The Abali has a stronger smell and taste of fermentation, or bacterial waste. The foulness is stronger in the Abali than in either of the Arvands. Oh, this is awful. Quaff rating: 1. The mint could make this almost nice; the aftertaste proves it. But it's almost impossible to drink it. Cough rating: 4. I was faced with a dilemma here: my rule is that a 5 will be given only to a soda which makes me throw up. This did not, but...let's say that if the same rule applied to the other end of the gastrointestinal tract, this would have gotten a 5. Quaff rating: 1. The scent was awful, even though the taste was not quite as awful. Unfortunately, it's almost impossible to drink without smelling it, so it still gets a 1. Cough rating: 3.5. Once it was in my mouth, it didn't actively make me want to throw up, and in small sips I could swallow it without wincing. But I'm a professional; I would not recommend this to anyone who wasn't specifically looking for a cheese soda. Root beer is a touchy subject. If you look around at soda reviews, root beer sparks substantial disagreements. People feel strongly about their root beers. While I like root beer well enough, it has never been a passion for me. Thus, I haven't reviewed much of it, for fear of angering the multitudes who would picket the Lab or possibly burn effigies of me. You might think that I could avoid that by reviewing some sort of widely accepted root beer, with which I could establish some sort of root beer credibility. As far as I can tell, there is no such root beer. So all I will say about my history with root beer is that the best root beer I've ever had was called "Boot Rear". I haven't seen it for years, so I feel safe extolling its virtues, on the assumption that none of the six people reading this will have had it. Another good option is to review something not because it is root beer, but because it is Weird. This one claims to involve molasses; it is thus Weird. And it has an "e" on the end of "Olde", so it's pretentious. It's Olde Rhode Island Molasses Root Beer. Have at thee! Color: Very very dark brown, opaque. Rapier: "Even the bubbles are brown!" Scent: Root beer, but with a sharp, birch-beerish note. Taste: Sweet, with an almost syrupy flavor (as in maple). Very strong. Citrusy undertone. Yes, absolutely. That's probably what gave it the birch beer scent; a licorice-y, anise-y, minty-yet-volatile-yet-vaguely-oily taste. Maybe it's sarsaparilla. Rapier: "You know that liquor which was just legalized in the States? Absinthe? It's a bit like that." Thicker than most root beers, kind of bright and biting. Very sweet. I don't taste molasses specifically, but I suppose it could be in there somewhere. It's good, but I'll bet it would be controversial among the root beer militias. Time to upgrade the Lab security systems. It earns accolades from the staff. Junior Assistant Tester: "I like it. More. I want more." Aftertaste: hard to assess, as I have lingering garden burger flavors from lunch. Let me have another swig. Oddly almost marshmallowish for a moment there. Interesting. Quaff rating: 4. Quite nice. Cough rating: 1.5. So sweet/syrupy that it could be upsetting to some. In the last few weeks, I've been indulging my love of cream sodas. More will be coming, and we will eventually have a cream soda tasting festival of some sort. However, here at Weird Soda Review, we don't really believe in following unvarying linear paths. We like cul-de-sacs, strange side trails, and interesting rocky slopes which lead round enticing overhangs, and look like you could probably manage to clamber up. Now, I am acutely aware of the dangers of curiosity. H.P. Lovecraft wrote extensively about how much trouble you can get into investigating things. Robert Frost's famous poem "The Road Not Taken", for instance, is actually based on a previous work of Lovecraft's. And that has resulted in the loss of my sanity and probable consumption by tentacled horrors. But this is who we are. Curiosity is in the warp and weft of our neural networks here at WSR. If it weren't, this would be "18 billion varieties of Diet Coke Review". So we had to ask the questions. What if it's cream, but not vanilla? What if it's vanilla, but not cream? Ah...an interesting question indeed. And that's how we come to the soda being reviewed today. This is Dry Soda Co. Soda: Vanilla Bean. The Weird Soda Review Lab has already quaffed some of Dry Soda Co.'s other varieties, including Lavender, Kumquat, Lemongrass, and Rhubarb. In general, they've been surprisingly palatable, if very simple. I have high hopes for this. Unfortunately, the rest of the Lab staff are out on a fact-finding mission, so I am tasting this one solo. Color: totally clear. No color at all that I can see. Scent: Faint, recognizably vanilla. This bottle is pretty cold, so I'll have to check back on this as it warms up. Sweet, maybe just a hint of acid; could be the carbonation. Smells kind of nice. Taste: Like much of Dry Soda Co.'s line, the taste is faint. The basic taste of carbonated water is prominent, but with a sweet vanilla laced through it. The vanilla tastes slightly oily; I wonder if it's some sort of essential oil? It's nice, though. The vanilla isn't the bittersweet vanilla like that in the Natural Brew; it's more like the sweet vanilla in Faygo's or Henry Weinhart's. Quite drinkable. Sweeter than most of the Dry Sodas, not too dissimilar from their Lavender. Much like a very light, cleaner/less syrupy sweet vanilla creme soda. This makes me wonder what exactly the "creme" is in most creme sodas. Quaff rating: 4. Quite pleasant, although would not be satisfying if you were looking for a typical soda due to the very light flavor. Cough rating: 0. There's really nothing objectionable in this. Aftertaste note: the delayed aftertaste is pretty sour, which is normal for soda. The scent never really got any stronger. *OK, this was NOT actually written by Lovecraft. It was actually written by Francis Bacon**. **No it wasn't. And Robert Frost wrote his own poetry***. The Kibbitzer-in-Chief still doesn't like soda. That's OK; it's important to the integrity of the Lab to have someone who is not enchanted by the very idea of the things we are quaffing. I've never quite understood it, though; to me, soda is a source of joy, even revelation. Well, she has found something this time which may indeed produce revelation. I fear, though, that it may be revelation of the "forbidden, soul-crushing knowledge humanity was never meant to have" variety. While out and about today, the Kibbitzer made a visit to Persepolis Market, which is a specialty Persian market in San Marcos. The Kibbitzer-in-Chief had some specific items in mind (she came back to the Lab with a variety of interesting things, including pomegranate molasses), but that didn't stop her from acquiring some Weird Sodas when the opportunity presented itself. There are other things which can be acquired opportunistically. Such as nasty infections. She called me at my work after she had returned home, and told me that she and the rest of the staff had brought home some Weird Soda, and that they had sampled it. "How was it? ", I asked. Silence on the phone. I didn't know you could hear someone shuddering with horror. You can. "You should come home," she said, "and try it." "The kids didn't die," she said. It was then that I knew that this situation would call for my full capacities as the Quaffmaster. This was the real thing--a Weird Soda loose in the field! Less experienced tasters down, possibly injured. A cry for help. My calling. "That sounds delightfully awful. I'll be home soon," I said. So here I am, sitting at the counter, with an unopened bottle of Abali Original Flavor Yogurt Soda. The Kibbitzer had mentioned that the soda involved yogurt. Yogurt drinks, as nice as they can be, are not really Weird. But then she confirmed that it was also carbonated. Carbonated yogurt is emphatically Weird. I have no fear. NO FEAR. She also mentioned it being lumpy. Color: when quiescent, it is separated into two layers. The top is whitish and translucent--not transparent--and the bottom is opaque, creamy white. This is presumably the yogurt part. The bottle suggests shaking gently before opening. I do so: oh God. There are now little chunks of whitish stuff swirling in the upper part. This is not a homogenous mixture, but it's not like the fruit pulp you see in stuff like Orangina. It's curdled. Scent: EEEEURGH! Oh my Lord. Bile rises in my throat. The Kibbitzer-in-Chief is laughing at me. It smells--actually, it smells a bit like Biotta. It's the lactic acid, I think, but this isn't like buttermilk or plain yogurt. It's hideous. A deeper sniff (shiver) reveals the distinct smell of wholesome yogurt underneath, but the top layer of the smell is almost indescribably bad. Taste: Let me preface this with another excerpt from the phone call. K-i-C: "I don't know, it wasn't on my tongue that long." Junior Assistant Tester: "It was on MY tongue. It was awful." Remember when I wrote about the hypothetical possibility of a cheese-flavored soda? The universe likes its jokes, doesn't it? The taste is very, very strong: a combination of fairly strong carbonation (and the accompanying acid) and slightly fermented plain yogurt. The yogurt is extremely tart; it's more like buttermilk or sharp cheddar cheese than yogurt. There are two distinct flavor layers here. The carbonated yogurt is on the bottom. It's strong and very Weird, but tolerable (sort of); very much like salty, carbonated buttermilk. I would never seek it out, but it's not hellish. The top layer, which is to the bottom as a scum of poisonous toxic waste is to the murky swamp water on which it floats, is so awful that it almost defies description. But I'll do my best. There is something about it which is strongly reminiscent of the Biotta Digestive Drink. Since the two have very little in common, I'll have to hypothesize that it is a fermentation product; something in the bacterial waste. But really, I'd rather not describe it. I'd rather not drink it anymore. Ugh...blech. Maybe if I shake it up a bit. No, that's worse. This stuff is really foul. Personally, I think it's slightly less foul than the Biotta (in the sense that death by guillotine is better than death by cheese grater); the Kibbitzer disagrees. I'm pretty sure I'm not going to be able to finish the bottle, though. I thought that taking a bigger swig might let me provide a deeper analysis. It almost let me provide a thoroughly visual and tactile analysis of the near-term digestive process. I've consumed about a third of the bottle, and prudence suggests I stop there. We have learned something important here. If my hypothesis is correct, we may have discovered something in common between several pretty foul Weird Sodas: bacterial poop. The ingredients list of the Abali is succinct: milk, carbonated water, yogurt culture, and salt. That such depths of horror and nausea could be contained within those seven words (if you count the "and") is a testament to the poetic skills of the bottler. The Kibbitzer-in-Chief is gleefully reminding me that she obtained samples of two additional flavors of Abali, to be sampled in the near future. And yes, I shall quaff them. Such is my calling and destiny. Quaff rating: 0.5. I like cheese. I don't like cheese soda, apparently. Cough rating: 4. I didn't throw up, but I suspect I would have if I'd gone further. It has come to our attention that the Obama administration is considering a tax on sugary beverages (including, but not limited to, soda) to fund the substantial cost of his proposed health-care reforms. Apparently, this tax would amount to something less than a dime of extra cost for a bottle of soda. The soda tax seems, at first glance, like a good idea; consumption of sugary soda could certainly lead to health problems such as obesity and diabetes, so taxing it could pay for expanded health care while discouraging the behaviors which make that care necessary. Seems like a win-win. In the end, though, I feel that the soda tax is a bad idea. Not a horrendously bad idea, just a not-so-hot idea. Maybe an "Abbondio Chinotto" bad idea, as opposed to a "Biotta Digestive Drink" bad idea. The Kibbitzer-in-Chief has politely requested that I leave her out of this, so I'll just state my position on the issue. I object in general to tax policies which are intended to manipulate behavior. While definitely left-leaning politically, I have a strong libertarian streak as well (which explains my tendency to end up completely indecisive). It seems to me that if you're going to have a government which does things that cost money, some sort of taxation will be required. However, to me it seems that those taxes should be levied in the most objective and neutral manner possible. I don't have a big problem with varying tax rates based on income, but I don't like the idea that certain behaviors should be taxed heavily (to discourage them) or produce tax breaks (to encourage them). In general, I would rather see people make their decisions about what to do based on what would be the best choice for them, not on which will avoid tax penalties or provide tax breaks. Highly targeted tax policies also tend to be unjustly applied; why would sugary drinks be taxed, but not hamburgers and candy bars? And, along the same lines, they encourage increasingly elaborate behavior; this tax will presumably define the taxed beverages in some specific way, which provides a reason to try to redesign one's product to wiggle out of that definition. It'll ALL end up being Weird Soda, but Weird for tax evasion purposes, and that's not the good kind of Weird. I don't want to see "H&R Block Approved Grape Cream Soda: Drink By April 5 for Best Refund". If the tax is passed, it would not inspire me to revolution (time for a Boston Kombucha Party! ), but I imagine I'd heave a sigh. Or at least roll my eyes. In any case, Whole Foods is full of unusual stuff. Cheeses made from lemur milk, aged in caves for some ungodly number of years. Soups consisting of vegetable protein so thoroughly and sadistically tortured and processed into looking and tasting vaguely meatlike that I was surprised that PETCCO (People for the Ethical Treatment of Chloroplast-Containing Organisms) hadn't filed protests. Garden Burgers, which I grew to appreciate, but always suspected woul;d have been called "Field Patties" except that people would have assumed they were cow poop. Someone really should make a burger chain called "Cow Patties." Anyway, I fell deeply in love with Natural Brew Vanilla Creme Soda; it was unlike any other cream soda I had ever tried. And then we moved to North San Diego county, and I haven't seen it since. Until the Kibbitzer-In-Chief told me that she had seen it at Frazier Farms. I hurried over and got some, noticing as I did so that Biotta--yes, that Biotta--doesn't just make "Digestive Drink". More on that some other time. And now it is here with me. No second thoughts. I've decided...to quaff this and see if memory has become over-gilded. Color: pale golden brown, like a lightly-toasted marshmallow. Scent: fairly bitter vanilla. Unlike some other cream sodas, very little tart in the scent, and not all that much sweet--this smells a lot like vanilla extract, like you get in little brown bottles at the store. You know, the stuff that's something like 80 proof. Whee! There's definitely something else under it--probably a sweetness. Taste: Hmm. Quite clean--there isn't actually all that much taste. It's mild, slightly bitter vanilla, with a sweet tone. Very little acid. Tastes kind of like Haagen-Dazs Vanilla ice cream, as opposed to some sort of french vanilla ice cream--there's a lot of vanilla bean in this. Interesting. Definitely the most vanilla-beanish of the cream sodas I've had. According to the label, this is made from "the finest Madagascan Bourbon Vanilla Beans". The ingredients list simply calls it "natural vanilla with other natural flavors". There's an acid bite from the carbonation, but not much tartness at all; the vanilla bean flavor lingers for a bit, then fades quickly, leaving a plain sweet aftertaste. With the slightly bitter vanilla, moderate sweetness, and clean flavor, this is actually kind of reminiscent of some of the sodas from Dry Soda Co. They do make a Vanilla Bean flavor, and I got some at Galcos--I'll have to do a comparison. It's for Science! This is nice. Maybe not the singular glory I remember--I've had some good Weird stuff since those days--but still one of the nicer cream sodas. Unusual, pleasant. Quaff rating: 3.5. Not unearthly, but very good. Cough rating: 0.5. I could imagine the bitterness putting someone off, but it's balanced nicely with the sugar. And who doesn't like vanilla extract? The Mysterious Stranger strikes again! As I walked by the mailroom at my place of business today, I caught that telltale gleam in my mailbox out of the corner of my eye. My heart swelled with joy. I moved into the mailroom--not prancing, mind you, but with a definite spring in my step--and found a bottle of joy in my box. God bless you, Mysterious Stranger! You fill my heart with gladness and my box with Weirdness. Today, the Stranger has left me a sample of Filbert's Banana. 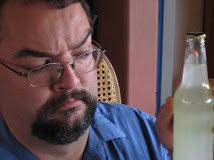 As it turns out, we have reviewed this particular weird soda on a previous occasion. However, it was one of the first Weird Sodas the Lab ever reviewed; it was prior to the use of highly standardized and scientific Quaff and Cough ratings. Thus, I am very pleased to be able to give Filbert's Old Time Quality Banana Soda the new, updated, modernized Weird Soda Review taste Test. Thank you, Mysterious Stranger! Color: Bright, bright yellow. The departmental assistant--a woman not easily fazed--said "I'm not going to tell you what that looks like." This isn't the creamy yellow of Post-It Notes, this is an ever-so-slightly greenish yellow. A yellow more like that found on warning stickers. Scent: strong synthetic banana. I shall call it "Bananinator". It's not totally unlike the smell of banana bread--it's RIPE Bananinator. Taste: The banana is definitely the dominant flavor, strong attack. As it fades, I'm surprised by the lack of tartness-0-there's just a hint of acid. Unusual in a soda to be so sweet without a tart aftertaste. Actually, there isn't much afetrtaste at all, just a moderately-fast-fading banana taste. In my mind, the bright yellow Bananinators march in a line, but as they pass you see that their metallo-pulpy feet have left no imprint on the ground. They march on, leaving one unsure if their onslaught was simply a passing daydream, with its factual existence only hinted at by the faint, lingering fruitiness in your mind. OK, that ended more strangely than I intended. More quaffing. Hmm. There is a bit more tartness now, even in the initial taste. How odd. The banan is strong, but there's a rising note of sour/herbal. It's faint, still, but present. Perhaps it's a lasting aftertaste of the first quaffing--persisting just under my perceptual threshold, only to manifest as the next quaffing passes. The ground trodden by the Bananinators seems to be unmarked, but as I walk it, there is the faintest feel of hardness in the ground--as if tiny filaments of metal and cellulose, deposited imperceptibly by the passing of the Bananinators, were weaving themselves into some sort of unholy Banandroid device, taking shape beneath the soil. The herbal is fainter this time, and has a slightly more bitter taste. It's mostly sweet and banana-ey. The secondary Banandroid's shape stops self-assembling. The time is not right; better to wait thus, half-formed, conserving its energy until a more optimal moment. And beneath the unmarked soil, the Banandroid half-slumbers. Dreaming, not dead, lying eternally until the stars are right. Only the faintest hint of banana-scented industrial solvents arise from the soil to betray its lurking menace. Quaff rating: 2.5. Overly sweet and fake-tasting, but as banana sodas go, pretty nice. Cream soda. Ah, cream soda. When I was but a wee lad, my parents brought home Shasta sodas. Even at the time, this was fascinating; whereas soda pop (as I called it then) was usually just Coke or Pepsi, this was different. It came in a lot of different flavors. It had variety. And it came in cream soda. I had never had cream soda before Shasta. What a fantastic flavor! Even then, my relationship with soda was not normal. Already, I had come to value Weirdness in this beverage--this fizzy, sweet family of possibilities. Shasta showed me the first hint of what Weird Soda could be, and it made me the man I am today. But back to cream soda--for me, cream soda is one of the real highlights of the soda world. It is without a doubt my favorite soda phylum, and I have found that it can possess complexity and subtlety rivaled only by root beers. There are so many varieties, and to the layperson they sometimes all seem alike. But to the initiate, to the one who has the "tongue to taste", they show incredible variance. I really like cream soda. But until that glorious day, I'll take it slow. Tonight, we'll just keep it simple. Before me, I have a Henry Weinhard's Vanilla Cream Gourmet Soda. The label aims for classy, embossed with pictures of barrels and a portrait of a guy with a beard. This is, presumably, Mr. Weinhard, although this is not confirmed, and I suppose it could be anybody. It could, for instance, be my uncle Loring in his heady, impetuous youth. It could be Randolph Carter. It could be Genghis Khan, in the years he spent as a Mongolian preppie. I digress. There is one disappointing thing: while below the aged barrels as Genghis "Loring" Khan, the label claims that this is "A gourmet soda, hand-finished with natural flavors, and only the freshest and highest-quality ingredients", on the nearby ingredients label we find "High Fructose Corn Syrup" as the second ingredient. I hope it's at least fresh HFCS. As to it being "hand-finished"...some things are best left un-speculated-upon. Interestingly, honey is one of the ingredients. That's a new one on me. We also have "pure vanilla bean extract", as well as unspecified "botanical extracts". I think those are sometimes found in shampoo or something. With some luck, this has the same stuff that's in "Herbal Essences" shampoo...you know, the one which claims to be a "totally organic experience". That would be fun. Or maybe it's Genghis "Loring" Khan's lawn cuttings, steeped in Mongolian yak milk. We really don't know. But it's hand-finished. And fresh. I know it's fresh, because "sodium benzoate (preserves freshness)" is also in the ingredients. In any case, the upper label tells an interesting story, in which it is suggested that this recipe provided a "refreshing alternative for our beer-drinking loyalists both during and after the 'Ignoble Experiment' of the early 20th Century". Theyre talking about Prohibition. Apparently, people denied their alcohol saw this as a refreshing (and presumably perfectly satisfactory) alternative to beer. This stuff is either the greatest cream soda EVER, able to calm crazed beer-deprived hordes, or it is being marketed by the same people who make the cheesy teen health education videos shown in high school. Let's do this. Cream soda rocks, even if it's marketed by Genghis "Loring" Khan. Especially then. Color: Surprisingly pale brown. Has a significant beer-like head when poured. Scent: sweet, vanilla-ey, and sharp. Some bite to it--a tart vanilla, as opposed to the more bitter, heady bourbony vanilla you sometimes get. Taste: Creamy, with significant tartness under the vanilla. Quite sweet. A definite creamy mouth feel. The vanilla is strong, but still a tart/sweet vanilla. Less tart than some; A&W vanilla cream is more tart, if I remember it correctly. Overall pleasant, very drinkable, slightly too sweet for my taste. It's still a cream soda, though, and that's almost always a good thing. Quaff rating: 4. Pretty nice. Cough rating: 0.5, just for the fact that it's very sweet. There are many avenues of Weird Soda research which intrepid investigators have been following. A lot of fruitful work has been done in carbonation intensification, including the possibility of bubble-based fusion*. Researchers looking into the conditions on Earth which led to the formation of self-replicating molecules have made great strides with Kombucha Wonder Drink. And, of course, the military's use of Biotta as a non-lethal (barely) weapon shows great potential. But the history of Weird Soda development--its origins, systematics, and evolution--holds probably the greatest promise for the advancement of Weird Soda Science. In the beginning, it appears that all soda was Weird. Only later in its development did the non-Weird classes appear. The Galco's Institute of Weird Soda Science has found descendants of these early Weird Sodas which have shown little change; the coelacanths of the Weird Soda world. (There have even been exciting recent examples of retrograde evolution, such as Pepsi Throwback). My status as a preeminent scienttist of the Weird Soda community allowed me to procure one of these "living dinosaur" Weird Soda speciments from Galco's. I plan to quaff it tonight. "Originally known as Moxie Nerve Food, legend says it was an aid to digestion, a cure-all for nervousness, insomnia, and exhaustion"
A cure for both insomnia and exhaustion? This is some impressive stuff. Let's check the ingredients. OK, I can see how the caffeine and sugar would help with the exhaustion part, but insomnia? Maybe that's the gentian root extract. And wait, there's one more thing I have to do. Hey, the kid's got Moxie! Color: dark brown, just a hint of purple. Scent: sweet cola, but with a strong herbal note. Maybe licorice? Smells a bit like Dandelion and Burdock soda. Taste: Whoa. WHOA. What the heck? Is that cough syrup? OK, here goes. The initial taste is quite sweet, vaguely cola-ish, but sweeter. Right behind that is a secondary sweet taste, with a strong chalky component, and a bit of mint. That part is odd--it reminds me vaguely of the tooth-polishing compound you get at the dentist, or quick-dissolve allergy medicine. But then it hits you. Right behind that--no more than a second behind--a bitter herbal taste surges up. It's not strong, the sweet is stronger, but it's quite distinct. It's similar to the bitterness of the Abbondio Chinotto, but weaker and with less citrus and coffee. K-i-C: "It's the gentian root. That's why it tastes like it's good for your stomach." As it sits in the mouth, the bitter and sweet circle each other, warily, like two jackals wanting the same piece of carrion. Their eyes never leave each other, watchful for a sign of weakness, of hesitation. There's no room for timidity. And then a slight acidity rises from below, permeating the scene like fog, drifting between and around the combatants. The aftertaste lingers, but it doesn't undergo any big changes. Those jackals are still circling in the fog, a minute or two later. It's interesting, but I can't really say I like it. The bitter herbal flavor is pretty weird. I suppose it might be an acquired taste; I haven't acquired it yet. Quaff rating: 2.5. Most of the flavor is pleasant. Most of it. Cough rating: 2. I have to give it at least two, because I actually coughed after my first sip. Oh, who am I kidding. I love video games. Not only that, but I think gamer culture is interesting. The heavy reliance on caffeine is particularly fascinating; I suspect that learned theses could be written on the topic. If media is any guide, gamers subsist almost entirely on beverages which amount to caffeine-sugar syrup. There are several brands, each of which portrays itself as the first choice of gamers, enabling them to play World of Warcraft: Waffles With the Lich King for seventy-two hours straight, reaching levels whose number cannot be expressed without new mathematical notations. While reading through the Think Geek catalog (which may well be the greatest catalog/web site/retail establishment ever created), I discovered Bawls. Bawls claims, oddly enough, to be the gamers' choice. It comes in a variety of flavors, all of which seem to amount to the same sugar-caffeine syrup as is found in the other members of its phylum. The primary appeal seems to be the name, and the fact that it comes in a blue bottle. This leads to some good conversations. "I was thinking of trying the blue Bawls tonight." "Yeah, but won't that make it hard to sleep?" The full title on the bottle is "BAWLS Guarana: High Caffeine Guarana Beverage". Under the ingredients list on the back, there is this ominous-sounding disclaimer: "Warning: this product contains high levels of caffeine." I consider myself duly notified. I noticed something interesting about the bottle. It does not have a mold code; no little row of bumples. It is, though, covered in a regular pattern of little bumps all over the bottle. No mere single row of bumps here: this stuff is LOADED with bumps. It has EXTREME bumps. I am guessing these make it easier to hold onto the bottle when the caffeine-induced jitters get severe. In any case, I found my Bawls at Galco's. And tonight, I say "Bawls to me!" Color: clear, with an extremely faint yellowish tinge. Scent: sweet and citrusy. Sort of like Sprite syrup. Taste: Absent. This is weird; it has almost no taste at all. It's carbonated, and when I swallow it, I'm pretty sure it was sweet, but I can't actually recall it being sweet while going down. Almost no aftertaste, but it leaves a slightly syrupy/sticky feeling in the mouth. OK, there's a very faint, citrus aftertaste, but still very little initial taste. I'm beginning to wonder if there's something wrong with my Bawls. I ask the Kibbitzer-in-Chief for a second opinion. Yeah, that's about it. When I wrote the intro to this review, I was joking about the sugar-caffeine syrup, but I think I was more prescient than I knew. That's really all this is. It's sweet, and ever-so-slightly citrusy. There's a certain Zenlike purity about Bawls; it's the Ikea coffee table of Weird Soda. Its form has been so thoroughly dictated by its simple function that it has shed any extraneous elements, and exists as a focused, purely functional entity. It exists, and its existence is defined solely by its purpose--to keep you awake and enable your thumbs to twitch at eye-blurring speeds. As I quaff it, the Litany against Fear from Dune echoes through my mind, except now it is the Litany against Sleep. I must not sleep . Sleep is the n00b-killer. Sleep is the little-death which brings pwnage. Where the Bawls has gone there will be nothing. My covers lie undisturbed, my pillow unused, and my mouse worn out. And all your base are belong to ME. Quaff rating: 2.5. I don't really see the point, unless you're trying to stay awake. It seriously has no taste. Cough rating: 0.5. About as offensive as club soda. In our continuing attempt to bring Weird Soda to the masses, the Weird Soda Review Lab staff made a visit last night to the home of some dear friends. And yes, we brought some Weird stuff. One might think, based on some of the things which we have reviewed in the Lab, that bringing Weird Soda to one's friends house would not be a very friendly act; Kombucha Wonder Drink is the sort of thing which can induce mass hysteria, rioting, and pit brother against brother in vicious Thunderdome-style battles for the right to not drink it. ("Two men enter! One man quaffs!") If you've ever seen "They Live" (a fine Weird movie), then imagine the fight over the sunglasses, except instead of sunglasses it's a bottle of Biotta. But we've also found some Weirdness which is quirky, pleasant, or even delicious. I brought specimens which I suspected would be of this variety to our friends' home last night, hoping that by the end of the night there would be more sighs than sirens. On the menu tonight were "Mr. Q. Cumber", a cucumber flavored soda I found at Mitsuwa Marketplace, and "Hotlips Pear Soda", from Galco's. I figured that fruits and vegetables (yes, I know cucumber is a fruit) should be all right. Right? Wait; sauerkraut is a vegetable product, too, isn't it? This was the home of Gillhutt (an engineer) and Neighsayer (a former horse-trainer) and their son Rootin'-Tootin'-Kitten-Cabootin' (who, in Lab parlance, shall be known by his acronym RTKC). These people are very good friends; when we arrived at the door with Weird Soda, they not only let us in, but even fed us dinner. Once the Lab staff and our friends were gathered around the table, we opened the bottles and the quaffing commenced. We began with the Mr. Q. Cumber. Color: A long look was had by all. Lead Assistant Tester: "Citrine green!" Yes, citrine, the gemstone. He's kind of Weird too. Neighsayer: "That's just what I was going to say!" Gillhutt: (looks carefully) "A clear liquid with a light green tinge." Did I mention that Gillhutt is a materials engineer? It's clear, with a pale green tint. About the color of light green bottle glass--you know, not clear, but not the dark green. The color that Coke bottles once were. Scent: Hmm. Actually, remarkably accurate. It smells a lot like cucumber, with a slightly sweet/tart tone. Faint, but not extremely so. Not overpowering.The Lab staff and guests seem intrigued. Gillhutt: "Smells like raw cucumber when you're cutting it." At first, I thought he said "gutting", and I was going to be afraid. But he assures me he is not so violently disposed toward cucumbers. Neighsayer: "Once I stick it up my nostrils, I can smell the cucumber!" Note: No soda was actually snorted up her nose, but we did check to make sure. Lead Assistant Tester: (out of nowhere) "Zucchini!" Enthusiasm is growing amongst the tasters. The smell is fairly pleasant. Neighsayer: "Mmmm! I kind of like it!" It's quite a bit more tart than I expected, but that's not a bad thing. Itty bitty sweet pickles are one of my favorite foods. This doesn't actually taste like those, but the combination of sweet, sour, and cucumber tastes nevertheless puts me in a good mood. The coolness of the cucumber taste combines nicely with the sweet of the cane sugar. Kibbitzer-in-Chief: (sounding surprised) "It's really nice." Neighsayer: "It tastes like a fuzzy cucumber. A crisp and fuzzy cucumber!" Lead Assistant Tester: "It tastes like a sourish-sweet cucumber with a bitter aftertaste." I don't get much of a bitter aftertaste, but I see what he means. It tastes a bit like cucumber slices with their peel, sprinkled with powdered sugar and lemon juice. Except that it tastes good, whereas that sounds icky. Neighsayer: "Carbonated cucumber iced tea." She then proceeds to pour some tea made from crushed scented geranium leaves, which is also tasty. Junior Assistant Tester: "Bubbly cucumber sauce!" Note: Normally, an exclamation such as this would probably be an attempt to avoid swearing (e.g. "Oh, fudge!") Such is the power of Weird Soda, though, that it is in this context an entirely reasonable statement which, in fact, conveys enthusiastic approval. So the Mr. Q. Cumber was acclaimed a success, and provoked jubilation and merriment in the throng. But we weren't done. After some water to clear our palates, we moved on to the Hotlips Pear Soda. Where and when: purchased April 2009 at Galco's, Los Angeles. Color: This may present a problem. The jubilation in the crowd fades, to be replaced by a feeling of mild apprehension. It comes out of the bottle a slightly murky light yellow-green. There are bits of something floating in it. It's disturbing. Lead Assistant Tester: "Looks like apple cider with a few drops of pond water." That's a bit charitable. It looks like a urinary tract infection. Neighsayer: "From someone who's an ex-veterinary assistant and who has taken a lot of horse 'samples', this is just what it looks like when it's de-foamed." Oh, that can't be good. I wasn't even aware that horse urine had to be "de-foamed". Urk. Gillhutt: "It looks like runoff water from the rain forest." We soldier on, hoping the scent will not resemble that of horse urine. We'll rely on Neighsayer for confirmation. Scent: Surprisingly sweet, with a touch of tart. It does smell somewhat like pear, but not as much I might have guessed. It's sharper than I would expect pear to be. RTKC: "Smells like pears!" Or maybe I'm wrong. Gillhutt: "I smell ginger in this. (sighs deeply)". The sigh is very expressive, speaking of resignation to one's fate. I'm not sure if it's joyful resignation or "I'm-on-my-way-to-the-gallows-but-boy-what-a-good-ride" resignation. Neighsayer: "You know when you get the dried pears in the fruit section? It's like that." Gillhutt: "It smells like watered-down bad Australian ginger beer." Apparently it was the second kind of resignation. Lead Assistant Tester: "Smells like rotten green apple cider." The Kibbitzer-in-Chief seems to agree; she's checking the bottle for alcohol content. Nope. Taste: Quite a bit sharper than the smell. Very tart, with a bit of plantish taste, but oddly does not make me think of vegetable. Kibbitzer-in-Chief: "You mean herbal." Yes, that's it. Herbal. Lemon and apple flavors, but actually not much like pear. Pleasant, but odd. No tannins. Kibbitzer-in-Chief: "Oh, it tastes much better than it smells. What a relief." Gillhutt: "This would go well with Harp." At first, I think he said "heart". Combined with the gutted cucumbers earler, I am now becoming seriously afraid of Gillhutt. He never seemed murderous before. Do I blame the Weird Soda? I grab the bottle, preparing to break it and defend the Lab staff as we make our escape. Gillhutt: "No, Harp. The beer." Oh. Kibbitzer-in-Chief: "Tastes like mulled cider from the fridge." Everyone seems happy with this one too, if somewhat nonplussed. There seems to be an attitude of surprise, but acceptance of the new order. So we still have our friends, and Gillhutt didn't kill any vegetables or people; the Q. Cumber was a big hit, and the Hotlips Pear had a pleasant if somewhat surprising taste. Just don't look at it. Quaff rating: 4. I wouldn't have guessed cucumber soda would be this nice. Quaff rating: 3. Pleasant enough, but the taste is strong and kind of odd. Cough rating: 1.5. The appearance is bizarre. The Weird Soda Review Testing Labs pride ourselves on our cosmopolitan attitudes. We're equal-opportunity quaffers; it can come from anywhere, and we'll quaff it. We've already tried things from a number of places. Today, though, we have something which claims to be from El Salvador. It comes in a clear bottle, and it's labeled Kolashampan. It further claims to be "La Original", and to be "Sabor Unico de El Salvador" (which translates to "The Unique Flavor of El Salvador"). The name "Kolashampan" is superimposed on an irregular outline which, on further research, seems to be the outline of El Salvador. One gets the impression that this is a soda strongly associated with the nation of El Salvador, possibly uniquely so. In fact, this could (based on the translation of the label) actually be El Salvador-flavored soda. That's even weirder if you continue the translation of the Spanish, but let's not go that far. Weird Soda is one thing; blasphemy is quite another. Yes, I agree that the Biotta Digestive Drink is, in and of itself, the very incarnation of blasphemy against any Deity which could be considered benevolent. But let's move on. This looks to be Weird enough as it is. 2) I had a chance, purely by accident, to show this to someone prior to drinking this. She recognized it--she had actually had it before. In more than one guise. She was from Colombia, and had been all over central and south America. She informs me that there are sodas named after several countries: Venezuela, Colombia, Brazil, etc. All of them look like this, except the names are different. And, according to her, all of them taste exactly the same. She was unable to describe how it tasted, except to say that it did not taste like Orange Crush. It's some sort of El Salvador-flavored Soda Borg, gradually taking over the Americas. I am so looking forward to this. Bring on the Salvador! Color: bright orange, clear, slightly brown-tinged (as opposed to red). Scent: bubble gum, quite strong. Taste: Not like Orange Crush. There is a bubble-gumish taste to it, but it's not as strong as the scent. Behind the bubble gum, and emerging slightly after, there is a very sweet yet slightly citrusy taste. It reminds me of candy orange slices, or maybe those weird circus peanut candies. The bubble gum is unpleasant, but the unusual semi-citrus which follows is kind of nice. The carbonation is strong, and adds bite to the citrus. However, I wouldn't call this a citrus soda at all. It's actually quite a bit like Juicy Fruit gum. Despite the name, it tastes nothing at all like either cola or champagne. Not much of an aftertaste, just the gradual fade of the circus peanuts. Maybe just the tiniest hint of a bitter edge in the very delayed aftertaste, but it's so faint as to be almost nonexistent. So there you have it. The unique flavor of El Salvador (which is not only unique, but identical to the flavors of Brazil, Venezuela, and Colombia at least) is Juicy Fruit, or maybe circus peanuts. Quaff rating: 3. Reasonably nice. Cough rating: 1. I'm not all that fond of Juicy Fruit. Aftertaste Update, about two minutes later: I suddenly got a bizarre bitter/sour taste. It sprung out of nowhere, seizing my taste buds in its sinister biomechanical grip. The Kolashampan nanoprobes have undoubtedly taken deep root in my esophagus, and are gradually working their way up past my tonsils . The taste is possibly that of my own blood, being assimilated by the SodaBorg of Central and South America. It is my own unique taste, that of my very flesh, blood, and sinews, and with the last shreds of my consciousness, I can taste it becoming one with the Kolashampan. Today at the Lab we have a guest reviewer. Rapier is an old friend of mine, who has (to my eternal admiration) elected to make his first review that of one of the Asian sodas I obtained from Mitsuwa. As far as I can tell, this is called "Ururu Cha". If I remember correctly, "Cha" means "tea", so we can presume that this is not exactly sweet and fizzy. Water, Adlay, Brown rice, Barley, Habu tea, Corn, Collagen, Aloe, Black beans, Soybeans, Yuzu, Vitamin C.
Collagen? Collagen? Great; it's a cartilage-flavored Weird Soda. I can only presume the aloe is to ease the suffering of my scalded quaffing spirit. And I have no idea what yuzu is. Rapier: "I like how they have pictures of the fruits and grains on the side, none of which I recognize." Color: Pale yellowish-brown. Rapier describes it as "Urine, but with mild dehydration". Kibbitzer-in-Chief: "It smells like the sauce they put on beef broccoli, which is, I believe, a black bean sauce." Junior Assistant Tester: "It kind of smells like syrup." Taste: Watery. Not much taste, actually. Not sweet at all, which given the lack of sugar is not surprising. Unfortunately, the "toasted whole grain" is still there. Rapier: "I'm assuming that all those ingredients are what they call popcorn dumped into water." K-i-C: "It's like you burned some popcorn, washed the pot, and then drank the residue." The taste is subtle, but persistent. Very mild, but what taste there is is reminiscent of the smell, and that is bad. K-i-C: "It's not as bad as the smell." Rapier: "That said, it doesn't taste like anything pleasant." Rapier feels that I am being a bit overly charitable. Rapier: "You can't recommend this to people. 'Rush right out and buy a six-pack of Suzu...ru..suru...(looks at bottle) Ururu!'" Rapier is right; when you take a small sip, the odor becomes stronger. This is bad, as one of the best ways to avoid the less pleasantly Weird of Weird beverages is to take smaller sips. This stuff has found a new avenue of attack, bypassing this defense. The usual avoidance strategies don't work! We're doomed! Rapier: "It's not as bad as drinking actual urine." I don't think that Rapier has actually done this, but the fact that he would use it as a comparison is marvelous. The man is a born Quaffmaster, waiting only for the right stimulus. Junior Assitant: "It tastes almost exactly like water." Rapier: "I wish that were true..."
I would think this might be an acquired taste, but it's not getting any better with repeated sips. Rapier: "There's always something new and unpleasant to notice about this soda." In the end, we finish our glasses, but decide not to finish the bottle. It's not so much that it's awful, but it's more than disappointing. Perhaps "Bad enough to count", but not all the way to "Inducing despair and rage at the world for producing it". I think the most likely effect of significant UruruCha consumption would be ennui tinged with lethargy, with generalized depression. Quaff rating: 2. It's not that it's undrinkable--it's more that there are more reasons not to. Cough rating: 2. Doesn't induce nausea, but puts one at risk of giving up hope. Blue Sky soda has an odd reputation. They make a series of natural-type sodas, often fruit flavored. I haven't had all that many of them, but those I've had have been all right. On the other hand, I recommend this as an instructive tale as to how it can go wrong. The reviewer (Tim, of Soft Drink Reviews--see the blog list on this page) has a profoundly unpleasant experience with their Black Cherry flavor. This one is just grape. How bad can it be? I mean, come on. Grapes. Grapes are nice, pleasant little fruits, used for much of history to make neat things like grape juice and wine. Like chardonnay. Oh, wait, that chardonnay soda was not impressive. And most grape sodas are not much like actual grape juice--more like grape Popsicles. Which is a good thing, except when it is a very bad thing. Er. I have no fear. NO FEAR! Color: The palest pink, almost clear. White Zinfandel? Rose? Scent: Grape popsicle. *whew* I have hope. Taste: Quite sweet, with a surprising bite. Some of that bite is the carbonation, which is unexpectedly strong. The grape flavor isn't very strong, but it's underlaid with an odd chemical, slightly bitter taste. It's very faint, inobtrusive; not even noticeable unless you're paying attention. Now that I've noticed it, though, I keep noticing it. It's bitter like a pill. The ingredient list is short: water, sugar, natural grape flavor, malic acid and graoe extract. Could it be part of the "natural grape flavor"? Well, it's not bad. This stuff doesn't provoke anything like the reaction Tim had to the Black Cherry Cherish. I could even enjoy drinking this. The aftertaste is oddly sweet--vaguely chemicalish, again, only the slightest hint. Just a bit of mystery to make it interesting. It's really not very Weird, unfortunately. But I've still got a box full of Weird stuff from Galcos; much goodness to come. Quaff rating: 3. Mostly pleasant. Cough rating: 1. Slightly not pleasant. During my pilgrimage to Galco's, I overheard the store manager expounding enthusiastically to a group of customers about a certain Weird Soda. I didn't catch the specifics--alas, I arrived too late--but I do know that it involved the original formula for Coke supposedly belonging to a different company. The hint of intrigue in the soda world piqued my curiosity, and I made sure to pick up a sample of the soda which was the subject of his exposition. It's something called Pennsylvania Punch. Apparently, it's related to another soda called Delaware Punch. According to Galco's web site, this is the original 1924 version of the Delaware Punch formula, re-bottled. Delaware punch is apparently no longer available, at least not made with real sugar. The phrasing on Galco's site implies a sense of deep betrayal at the fact that Delaware punch no longer uses real sugar. There is the further implication that Delaware Punch was purchased by Coke; this, perhaps, led to the Corn Syrup Sullying of 1924, and the subsequent Pennsylvania Rebellion, the fruits of which I am about to quaff. The label has a picture of grapes, and the soda does have a faint purple tinge to the brown, so I don't know about the Coke connection. Ah well; let's do this thing. Color: medium clear brown with a hint of purple. Neat label, looks homemade. Scent: Hey, this is a real bottle cap; I can't twist it off! The scent is grape, with a hint of iciness, maybe a touch of cream. Intriguing and pleasant. Quite sweet. Taste: Ooh, that's neat. Grape, but complicated. The grape is pretty much like the grape of a Popsicle (not a bad thing), with a strong sweet fading into tart. There's something else, though--some sort of volatility, something which gives it some headiness. It's almost like a bit of cream soda, but not really. There's complexity in the grape. It's a bit too sweet for my tastes--almost painfully so--but I like the taste aside from that. Kibbitzer-in-Chief: "Tastes like snow cone. Old snow cone--not like the kind you get from a cart, but like a raspada, a shaved ice. But it tastes defective because it's liquid. This snow cone is defective!" So a pleasant defective grape sno-cone. There we have it. Nothing whatsoever like Coke. I don't know what Coke did with this--do they even make a grape soda?--but this is pretty nice. This, for what it's worth, is bottled by the Natrona company. Quaff rating: 3.5. A bit cloying, but nice. Cough rating: 0.5. Just the excessive sweetness. You may remember a recent review we did at the Lab--the gibbering cyclopean soda-horror which is Biotta Digestive Drink. Well, just this morning we had a visitor at the Labs. You may remember Punctilius; she was part of the team of visiting Weird Soda Technicians who helped in the review of Vignette Chardonnay soda, along with Long Rod McBean. Well, Punctilius likes sauerkraut. When she heard the tales we told around the campfire about the horror we had all recently experienced, she expressed a desire to try the Biotta herself. Amazingly enough, we still had some--nobody in the Lab had been willing to drink any more (or even to open the bottle to pour it out). So we donned our hazmat gear and poured her a glass. She sniffed it. We noticed something odd; she wasn't grimacing in horror. What was she made of, this woman named Punctilius? Let me repeat that: after smelling it and tasting it, she voluntarily drank it again. I reeled in astonishment. How could this woman stomach the stuff? She smacked her lips. Now, let me assure you: she is neither an alien, nor a supernatural horror, nor a highly-trained Weird Soda Commando from the ancient monastery rumored to exist amongst the remotest peaks of Nepal. She didn't actually like the stuff, exactly. By this she meant that one could not correctly describe it as "not half bad"; it was precisely half bad. However, she had a plan. Punctilius: "Get me some honey." She proceeded to add a substantial amount of honey to the Biotta; the final ratio was probably about 4:1 Biotta:honey, by volume. After stirring, she tasted it, and pronounced it much improved. She then insisted on passing it around. Have you ever had that kind of nightmare where there is something you really don't want to do--something which fills you with mortal dread--but you have to do it anyway? One of those dreams where for some reason you have to crawl through a spider-filled cave, or something like that? I am the Quaffmaster, and this is my place. I voluntarily tasted the Biotta-honey solution. My mind is intact, as is my soul. My taste buds are slightly abraded. It was, in fact, improved, but in the same way that the pits of Hell would be improved by the addition of a vase of daffodils. In other words--it's still awful, but now there's something pleasant mixed in. The honey did make it more drinkable, at first; the intense sweet taste masked the most jagged, filth-encrusted edges of the taste. The aftertaste was, unfortunately, unblunted. Still, I feel that it is only fitting that we recognize Punctilius for her indomitable courage. Seeing one of the smoking abysses of the Weird Soda world, she strode boldly into the breach and left it better than when she came. Huzzah! Huzzah! Let her name be added the the roll of Weird Soda explorers, to be honored in the fizzy world yet to come.